Christmas is quickly approaching and I’ve been working on my holiday menu. My good friend, and most avid v:gourmet fan, Glenn, sent me a recipe awhile back for cauliflower steaks which I’ve kept tucked away until now. Good thing I pulled it out and experimented with it because it’s going to be on the table on the 25th for sure. 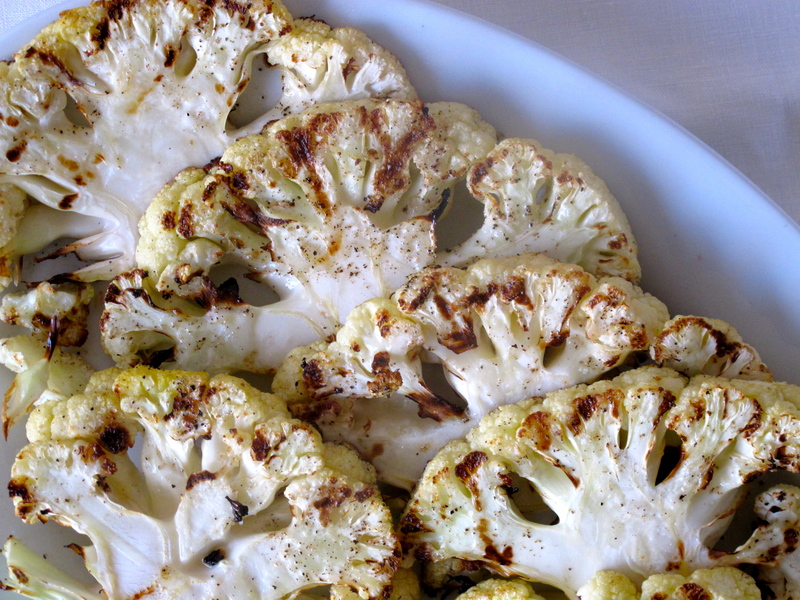 The cauliflower steaks themselves give you something “meaty” to cut into, with a great “mouth-feel” as they say. The accompanying purée adds a wonderful complexity and depth of flavour with a combo of apples, shallots, leeks, and thyme. Put it next to mixed quinoa – red, black, and white – and some rosemary tomato skewers and you’ve got a gorgeous plate full of goodness. I’ll be amping it up a bit (’tis the season) with wild mushrooms parcels, roasted squash, and other goodies. At the largest part of the cauliflower heads, cut a cross-section to create four to six 1-inch steaks. Drizzle with olive oil and sprinkle with sea salt and pepper. BBQ steaks over medium-high heat or sear the steaks in a frying pan over medium-high heat. Meanwhile, heat some olive oil in a frying pan. Add chopped shallots, leeks, the remaining cauliflower “off-cuts” from the steaks, apples, and thyme. Sauté until everything is tender and cooked through. Add white wine or sherry and reduce for 5 minutes or so on low-heat. Add sea salt and pepper to season. Purée in a blender until smooth. 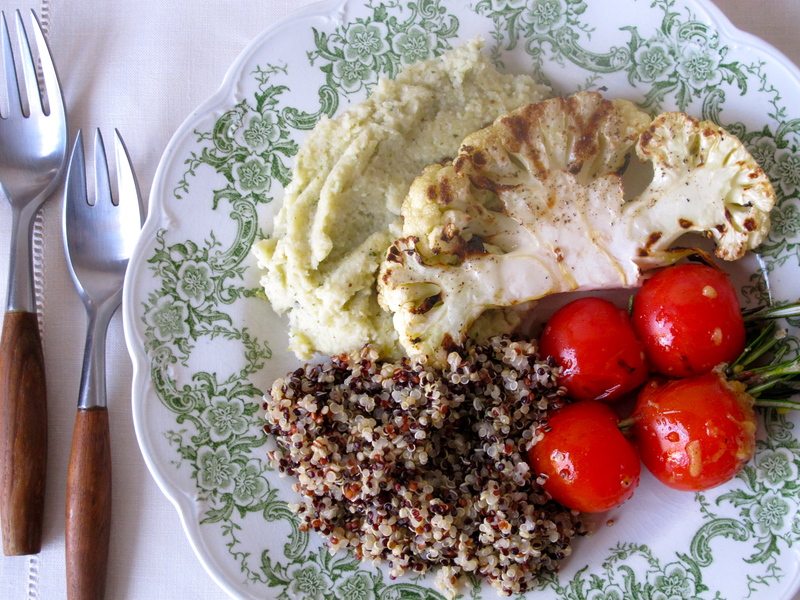 Serve the cauliflower steaks bien-placé on the apple shallot purée and accompany with quinoa, vegetables, or whatever else tickles your fancy. I have been meaning to try cauliflower steaks. The apple shallot puree sounds great with it. 🙂 I wish I could join you for your Christmas dinner! Thanks Janet – the steaks are fabulous! Merry Christmas to you and yours. Eat, drink, and be merry.